Selling online tickets is easy. This straightforward guide helps you sell online tickets and make money for your event in just five easy steps. Even if it’s not your first time selling online tickets, use these useful tips and suggestions to get the most out of your online ticket sales. A little prep up front will save you a lot of time. The first step when your’re preparing to sell online tickets is a list of the types of tickets you want to sell. For example, you could sell child, adult and senior tickets at different prices. You may also want to offer a family ticket for two adults and, say 3 or three children. It’s entirely up to you. Figure out the price you feel is fair for your event. Compare prices with similar events. Is your event better for some reason? Perhaps better food or better entertainment? If so, maybe you can charge more. On the other hand, are there reasons why your event may have to charge lower prices? A longer drive to get there or fewer attractions at your event? Either way, do your research up front to make sure you are charging prices that will make sense to your ticket buyers. Make sure your buyers can make an informed decision when buying. This step can save you a lot of grief later dealing with refunds from buyers who were unaware of important event details. our event location may have important rules like “no fires”, “no overnight camping” and so on. If so, it is important to make this information available to your buyers. Think about the various reasons why your buyers may ask for a refund. For example what if an attendee can no longer attend event? Bad weather on the day of your event? You cancel your event due to low attendance? Some events give refunds up to a certain date then none afterwards. Do your homework and be clear about the risks and your obligations based on your event and where it will be held. Does your event have any access limitations, or risks associated with the ticketed activity? Is there key information that every ticket buyer needs to be aware of? Make sure to include it on the ticket purchase page and on the ticket itself. Now the most important part! Write up these key items and review them well before setting up your your tickets. Include this information prominently on your tickets and on your ticket purchase page. This is a big topic, so here are some key things to look for. Use a system that has professional, well laid out tickets, a simple interface and plenty of special functions you’ll likely need once you get going, such as previewing tickets and order limits. You should be able to get going with no monthly charges. It is common for the event to pay credit card processing fees of about 3%. Get a ticket system where your funds from ticket sales transfer to your bank account within a few days. If successful, your event will likely grow over time. You may want to add more entertainment or a fundraising component or vendors to expand interest for your attendees. Get an all-in-one event software system that helps you grow your event. Get an all-in-one event software system that helps you grow your event. All-in-one systems like ClearEvent include event planning, registration, communications and a built-in event app. You can make use of the additional features as your event expands and your organizing team grows. Sell tickets with ClearEvent’s all-in-on event software system! The first step is ensuring you get paid! This is usually handled in your ticketing software. For example, ClearEvent software walks you through the process, enabling you to connect an existing Stripe account or create a new one. As part of this process, you’ll designate the bank account for deposit of funds from ticket sales. The whole thing should only take a few minutes. With your list from Step 1, it will be easy to create each of your tickets. Far better to have this information ready so you can just cut and paste than working out those details while setting up your tickets! There are often lots of settings in the Ticket section of your event software. You wont need all of them, especially at first. Many will be useful later as you become more comfortable with your system and as your event grows. When your ticket is available for sale. This is the bare minimum for your tickets and you can publish and sell online tickets with these minimal details in place. Once all the info is added you can publish your tickets, ready for sale! A good system will allow you to do test transactions to test every part of your online ticket process. This is key, if there’s a setting that is off or even typos, it is far better for you to catch and fix them now! For example, what if you mistakenly price your ticket at $2.50 instead of $25.00 like you meant?! It’s easy to find and fix these types of things before promoting tickets for your event. 4) Promote your online tickets! It goes without saying that you need to promote your event. People are distracted and have many choices. So, start early however much time you think you need, double it! Plan to message your audience multiple times in multiple channels. Ensure there is time to learn and make changes if you need to, well ahead of your event. Promote where people will be looking. Social media is key but don’t overlook printed signs, fliers and attention getting tactics that will be noticed by your target audience. When you feel you’re doing too much promotion, you’re probably just about doing enough! More is better and even more is even better than that! Monitor your results. What are people responding to? Where are they finding your promotions? Most importantly, what are they sharing with their friends? Use this information to shift more of your promotion resources into channels and approaches that are working for you. Whenever you get the chance, talk to your audience members to learn which of your methods caught their attention. Promotion can be a lot of hard work as you dial in the channels that work for you. Hang in there, especially if this is your first time. Usually, you’ll need to sell at least a minimum number of tickets to cover your costs. Is the number tickets you’ve sold what you expected? If so great! Otherwise, it’s important to figure out where the problem is and quickly. Think creatively and be prepared to try different solutions for each of these problems. Be open to the possibility that there is more than one problem. Listen to your team and trusted advisors. Test your solutions to get to an answer quickly. Persistence will usually pay off. Good monitoring and reporting in your ticket system is key to solving any problems causing low sales. It’s fun to Sell Online Tickets! Follow the five simple steps above and you’ll be well on your way to selling a boat-load of tickets for your event! It’s a great feeling to have things set up and running well, tickets selling and money flowing into your event bank account. Good luck and stay focused and sell lots of tickets!! 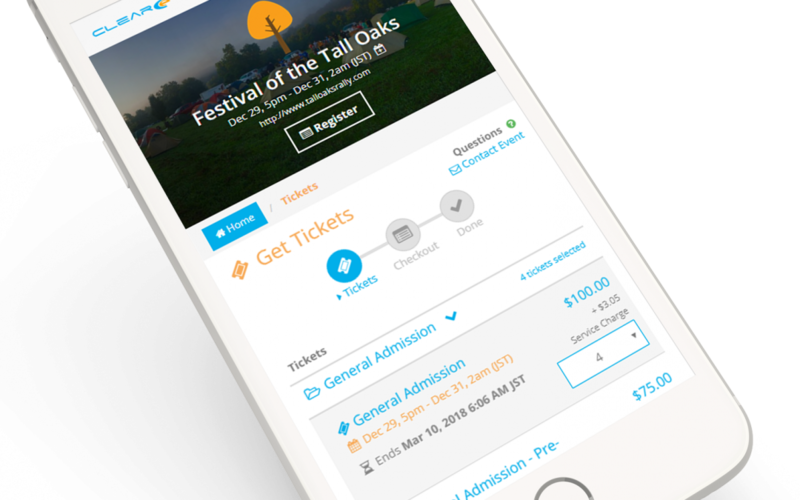 Check out ClearEvent’s ticketing feature!